Very Good. 0226474089 ALL BOOKS SHIPPED WITHIN 1 DAY OF PURCHASE! Very Good. 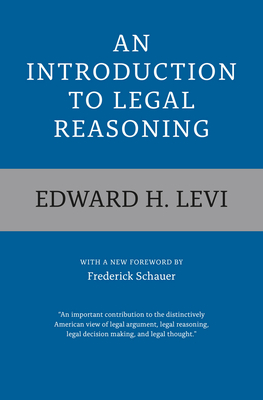 An Introduction to Legal Reasoning (Phoenix Books) by Levi, Edward H., 1962-02-01. Trade paperback (US). Glued binding. 112 p. Phoenix Books. Good. An Introduction to Legal Reasoning (Phoenix Books) by Levi, Edward H., 1962-02-01. Trade paperback (US). Glued binding. 112 p. Phoenix Books. This is an ex-library book and may have the usual library/used-book markings inside. This book has hardback covers. In poor condition, suitable as a reading copy. No dust jacket. Re-bound by library. 74 pages. This is an ex-library book and may have the usual library/used-book markings inside. This book has hardback covers. With usual stamps and markings, In poor condition, suitable as a reading copy. Dust Jacket in fair condition. Good. 0226474089 Ships from Tennessee, usually the same or next day. Fair. 0226474089 Ships from Tennessee, usually the same or next day.